Remember the pumpkin pie bites? Well, because I didn’t make a regular sized pie and made bites instead, I ran out of crusts before I ran out of pie filling. With 1 cup of pumpkin pie goodness sitting in my fridge and me being too lazy to make a little crust to bake it in, I decided to make muffins. Muffins that mirrored my now infamous cracktastic pumpkin oatmeal chocolate chip pecan cookies. Unfortunately, the muffins weren’t exactly what I was going for. I wouldn’t use both whole wheat flour and oatmeal if I were you. And the flavor wasn’t super pumpkiny. The poet loved ‘em, and I thought they weren’t too bad slathered in Earth Balance (and who doesn’t like chocolate chips in their muffins), but they just weren’t my favorite. Oh well. Next time I’ll play with it some more! Mix the dry ingredients in a bowl. Add the wet to the dry and mix until combined. Fold in the pecans and chocolate chips. Spoon the batter into a pre-oiled muffin tin. Fill up each muffin cup three-quarters of the way to the top. Bake for 20 minutes or until golden brown on the bottom. Do you really mean “pumpkin pie filling?” Because that’s got all sorts of stuff in it, right? Aww, sorry that the muffins weren’t exactly what you were going for – they look divine to me!! Well, they look heavenly even if they didn’t taste the way you wanted! they look cracktastic to me. ha, love the word. Even if they weren’t what you had hoped for, I could hardly call those gems a disappointment.. They still look tasty to me! 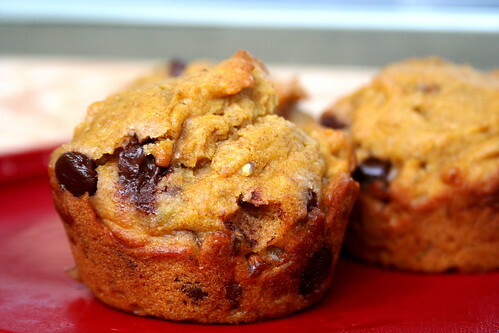 I would argue that any vegan chocolate chip pumpkin muffin is nothing to turn your nose up at! I find that muffins are like pizza…even when they’re not amazing, they’re still good! Those look fantastic to me! Sorry you didn’t like them though. These muffins sure look beautiful even if they didn’t taste as good as you thought they would. Sorry the muffins didn’t turn out as you wanted… I didn’t get lunch today though so I would gladly eat a few!